There are so many different statistics on the internet that spew off facts about the average American and their retirement savings. Most of this information is fairly similar, saying that the average American family only has between $5,000 and $10,000 in savings for retirement. No matter what source you use, that is not a good statistic, especially, if you plan to retire at 65 years old. That would mean that the average person who retires at 65 and hopefully lives for 20+ years would be living off of less than $10,000 for that duration. Now, that would be impossible. There are several factors to why working adults don’t put away money for retirement. For some it’s that their bills are too high thus not allowing room to take ‘extra’ money out of their paycheck, for others it may be that they don’t make enough to cover their basics, and yet for others they just aren’t thinking about or prioritizing their retirement savings. No matter where you are, there is always room for growth and change. Take a look at these two main reasons why it is important to start saving for retirement sooner than later. By investing in a retirement plan, you can grow your money much faster than in a regular savings account. A retirement account is a long-term savings plan that compounds the interest on your investment overtime. The more time that your money is in your account, the more potential it has to grow year after year. Plus, a nice bonus of having your money in a retirement account is that it is free from being taxed, depending upon the account and when you take the money out. Further, based on when you start saving and when you plan to retire, your financial planner and you can discuss the risk you are willing to take at this point in your life and review it as your situations change as well as your desired risk. It isn’t a set it and done thing. In conjunction with the point above, the sooner you start putting money towards retirement, the more you will have over time with less effort. When it’s in a compounding accumulation account, your money is working for you (not to mention your financial planner). It’s multiplying even when you are putting the same amount in each month (also known as “Dollar Cost Averaging”). Any financial planner would suggest allotting a portion of your paycheck towards retirement savings from the day you start your first job. This way you never know the difference of having that money to spend now or saving it for later. Keep in mind; if you didn’t start your retirement planning early on, it is not too late. Definitely contact your financial planner and figure out a plan that will work best for you at your current situation with respect to what risks you are willing to take for when you plan to retire. One tip to get you started is to assign 1% of your paycheck towards retirement and then increase that percentage each quarter/year. This way the change in your monthly pay won’t seem too burdensome from the amount you are used to getting each pay period. Don’t be one of those individuals or families with the scary statistics of less than $10,000 in retirement. The sooner you start saving, the sooner you will be able to retire. Today there are so many helpful tools and resources to help people get their financial plans in order and create goals of how to get there. It’s never too early to start planning for retirement. The earlier you do, the greater wealth you will have when you want to retire. 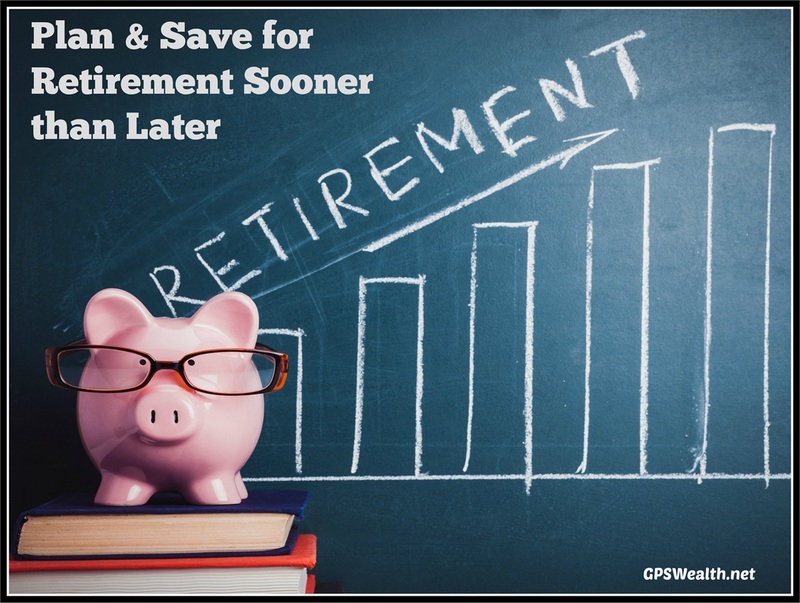 Should you have any questions about retirement calculators, when you want to retire and how much you need to set aside regardless of your current age and situation, GPS Wealth Management can help. Don’t forget to follow us on Facebook and/or LinkedIn to keep informed with all things financial as we post that sort of stuff regularly. Contact us today to get started saving for your financial freedom and your retirement planning. Securities offered through Securities America, Inc., Member FINRA/SIPC. Advisory services offered through Securities America Advisors, Inc. GPS Wealth Management and Securities America are separate companies. Securities America and its representatives do not provide tax or legal advice; therefore it is important to coordinate with your tax or legal advisor regarding your specific situation. The opinions and forecasts expressed are those of the author, and may not actually come to pass. This information is subject to change at any time, based on market and other conditions and should not be construed as a recommendation of any specific security or investment plan. Past performance does not guarantee future results. Dollar cost averaging involves continuous investment in securities, regardless of the fluctuating price levels. Investors should consider their ability to continue purchases through periods of low price levels or changing economic conditions. Such a plan does not assure a profit and does not protect against loss in declining markets.